Hisense will be launching a new smartphone called Hisense H20 on June 26th in China. The device was recently showcased at the CES Asia in Shanghai, China. It already got certified by TENAA with the model number HLTE510T. While Hisense is a lesser known brand in the smartphone segment, it is one of the world’s largest brands in TV segment. As of now, we don’t have any information the pricing of the Hisense H20 smartphone. It comes with a 3D curved glass back body and will be available in Gold and Blue color options. The device comes with a 5.84-inch display offering Full HD+ (2280 x 1080 pixels) resolution and 19:9 aspect ratio. 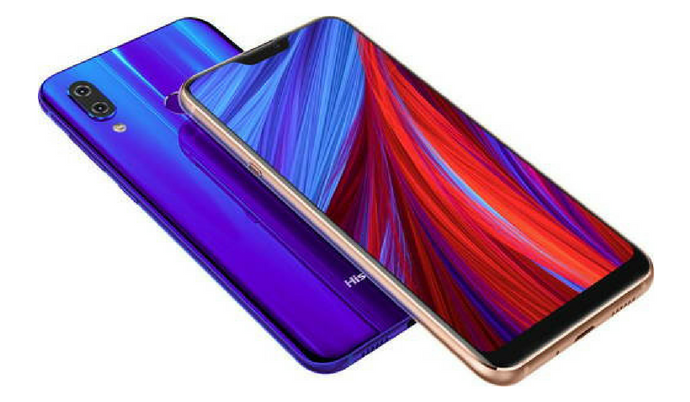 Following the current trend, Hisense also embracing the notch display with this smartphone. Under the hood, the device will come powered by the Qualcomm Snapdragon 636 octa-core processor coupled with 6GB of RAM. The device will be available in different storage options offering up to 128GB of onboard storage. There will also be a MicroSD card slot for further expansion of storage. It will be running on the latest Android 8.1 Oreo with the custom skin laid on top. On the top left corner, the device also sports dual rear cameras along with LED flash. There is also a circular fingerprint sensor on the rear. The Hisense H20 will be offering 12MP + 5MP dual cameras on the rear and a 20MP selfie camera on the front. The company will also integrate the AI features like AR stickers and auto scene detection. While the power button and volume rocker are placed on the right edge, the SIM card slot and an additional hardware button can be seen on the left edge. From the images, we can’t find the 3.5mm audio jack on this device. However, it got the USB Type-C port for connecting both power adapter and wired earphones. The post Hisense H20 AI Smartphone with Snapdragon 636 SoC Announced appeared first on PhoneRadar.